Less than a week ago, Philadelphia’s Lex Ludlow had his second professional mixed martial arts fight. Three days later he found himself back in the gym, only this time, it was a different type of gym, training for a different type of sport. Unfortunately the fight with Darren Costa at WCC 18 did not go his way and his pro record would fall to 0-2, but that didn’t mean that Ludlow was going to go home, sit on the couch, and sulk. Instead Ludlow sought out other opportunities. His lifelong dream of becoming a professional wrestler began on Monday as Ludlow went down to the world famous Monster Factory in Paulsboro, New Jersey for his first practice. The ego and charisma Ludlow brings with him were a perfect fit to make the leap into professional wrestling. After all, characters in the entertainment industry are built on personality and presentation, but skill is not necessarily always thrown out the window. You do have to practice the art and stay active in order to be effective and go over well with the fans. “Wrestling is not fake, it’s predetermined,” Ludlow says. He know pro wrestling was the path he always wanted to go down, stating that he thought he would only do one fight and that would be the end of it. 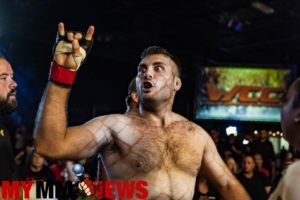 After seven amateur and two pro fights, he isn’t even entirely sure that he is done with mixed martial arts, but pro wrestling is where his heart currently lies. Lex Ludlow fact: Growing up his favorite wrestlers were Ric Flare, Mr. Perfect, Rick Rude, Kurt Angle, Eddie Guerrero, Macho Man, RVD, and The Rock. The Monster Factory Was founded and established in 2011 by Danny McDonald (Danny Cage). The MFP Training Center has been compared to a “mini WWE Performance Center,” complete with three 18 x 18 rings, wall to wall amateur mats, full weight room, showers, promo room, heating and air conditioning. The MFP Training Center also boasts more training hours available than any other facility of its kind. Current coaches at the Monster Factory are owner, Danny Cage, The Blue Meanie (WWE,ECW) , “Wild” Bill Wiles (ECW), & QT Marshall (ROH) & Punisher Martinez.